"Establishing Tradition Through the Pursuit of Excellence." During the Fall semester, all Freshmen will participate in the Symphonic Band. Prior to the end of the Fall semester, students will have the opportunity to complete a short placement and skills assessment based on current concert band literature. Students will then be placed into the most appropriate ensemble based on their current performance level. At FRHS, all students who participate in the Marching Band are eligible to earn a one-time, 2.5 Physical Education credit waiver. This allows Band students the opportunity to meet their PE requirements through participation in Band!! Small Instrumental Ensembles (course #2890 with Instructor approval) - This course is only available to students who participate in fall athletics at FRHS, and after meeting with the Director of Bands both parties find irreconcilable differences with scheduling. Students will have the opportunity to continue the study of their musical instrument at the high school level, perform solo repertoire appropriate for their chosen instrument and performance level, develop performance skills on a secondary instrument, as well as participate in small ensembles as course registration and/or instrumentation allows. Emphasis will also be placed on student proficiency in the language of music through the study of music theory and music history. Students who complete the small ensemble course during the fall semester will have the opportunity to participate in Symphonic Band (course #2805) or Select Symphonic Band (course #2806) and/or Jazz Ensemble-Stage Band (course #2840) during the spring semester. The FRHS Music Department also offers a variety of non-performance elective courses open to students at different grade levels. Q: Is participation in Marching Band required? A: Yes. All FRHS Band students participate with the Fossil Ridge Marching Band during the fall semester. **See FAQ#2 for questions regarding involvement in FRHS Fall Athletics. Q: I want to participate in Band, but I also want to participate in a fall sport. Can I do both? A: Yes! We do work with our Fall Athletes!! Please contact Mrs. Muñoz directly for questions about participation in both a FRHS fall sport and Marching Band. A meeting will be scheduled to discuss options. Each student situation will be handled on a case-by-case basis. Q: Does Marching Band require time outside of school and/or what does the Marching Band schedule look like? A: Yes. Generally the season starts with a rehearsal camp prior to the start of school. Once school begins, the Band/Color Guard practices two or three times per week outside of the school day. The Band/Color Guard also performs at home football games and several competitions throughout the state that are usually held on Saturdays in September, October, and this year, the first Saturday of November. The schedule does not vary much from year to year, so we encourage students/parent to refer to previous year’s schedule that can be found on the online calendar from the Fossil Ridge Band’s website Online Band Calendar. Q: Do I have to audition to participate in Band? A: While there is no “audition” to participate in the Band program, we often will have students complete a placement evaluation prior to registration to ensure that students are placed in the appropriate ensemble. Q: I’m concerned about my grades and how much time Band takes…what should I do? A: Join Band! Did you know that students in Band consistently have some of the highest GPA’s in the entire school, and the Band as a whole has an average GPA of 3.55, compared to the district average GPA of only 2.94! Q: I plan to take a number of AP courses in high school...can I still fit Band into my schedule? A: Absolutely! The vast majority of Band students complete several AP courses throughout their high school career. 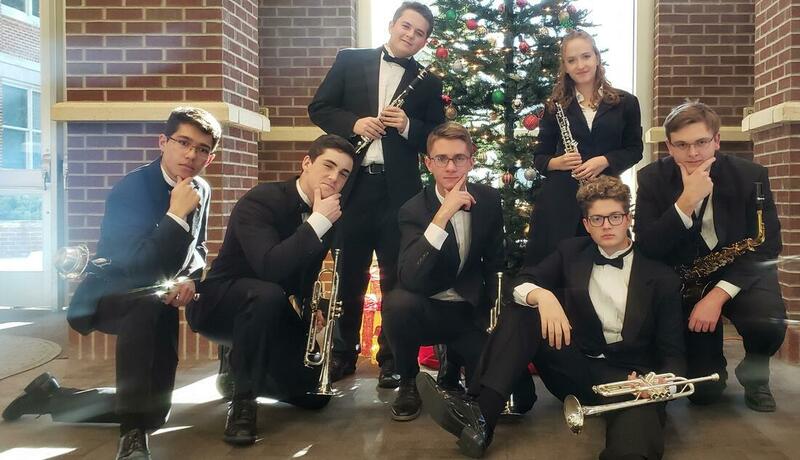 In fact, most report that their participation is Band is an extremely important component of their overall course-load, and the multiple sections offered of most AP classes make continued participation in Band a reality. Q: Can I also play in a jazz ensemble? A: YES! Fossil Ridge has two outstanding Jazz Ensembles. Jazz Ensemble I is open to 10th-12th grades, while Jazz Ensemble II is also open to Freshmen. All Jazz students must be enrolled in a regular Band class. Both Jazz Ensembles are currently scheduled as a “0-hour” class that meet outside the regular school day, so they do not take up an additional period in your schedule. Jazz rehearsals are typically Monday/Wednesday or Tuesday/Thursday, 3:00-4:30pm starting following the completion of the Marching Band season in after the first Saturday in November. Q: What does being a part of the FRHS Band cost? A: We ask all band and color guard students to contribute a $525 participation donation to offset travel and performance expenses. Students are provided with numerous fundraising opportunities to generate funds for this participation donation and other various fees through the Band program. Please feel free to contact Mrs. Muñoz for answers to any other questions about Band or FRHS. Membership in the largest, and one of the most successful, positive-image projecting organizations on campus. Likelihood of academic success - the Band maintains one of the highest Grade Point Averages for any group on campus at 3.55! Music students also outperform their non-music peers on standardized tests like the ACT, SAT, and CSAP! Positive camaraderie and support of older peers on campus. A positive social network that promotes academic prowess, self-discipline, creativity, teamwork, peer interaction, and leadership. Familiarity with the school campus prior to the first day of school. Opportunities for skilled preparation and public performance throughout the year. Recognition in an award-winning, nationally renowned program. College admissions officers continue to cite participation in music as an important factor in making admissions decisions. They claim that music participation demonstrates time management, creatively, expression, and open-mindedness. The College Board, in a publication about college admissions, states, "preparation and involvement in the arts have proven to be extremely valuable to college entrants whatever their intended field of study." Band provides students with an identity, a place to belong, and a place to be accepted by their peers.